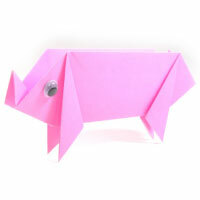 You can learn to make various kinds of origami pig here. This traditional origami pig is a very interesting model to work on. At first it looks like a 2D model but it is not. 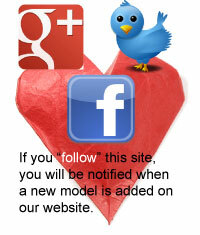 This model simulates four legs beautifully with a minimum folding steps. The folding techniques that you will lean from this model are both squash-fold and inside reverse-fold. 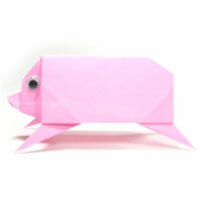 This easy paper pig requires you to follow 35 steps. The important folding technique that you will learn from this model is "locking fold" which is somewhat advanced folding technique used for a model like New Kawasaki Rose. 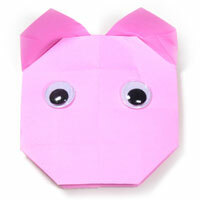 This simple origami pig is a simple model. However, there are a few folding techniques that you need to master for this model. They are petal-fold, inside reverse-fold, and outside reverse-fold.